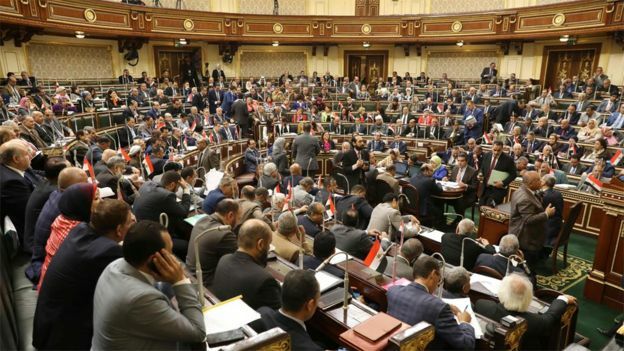 Egypt's parliament has approved constitutional amendments that would allow President Abdul Fattah al-Sisi to stay in power until 2030. They would also give Mr Sisi more power over the judiciary and further enshrine the military's role in politics. In 2013, Mr Sisi led the military's overthrow of Egypt's first democratically elected president, Mohammed Morsi, following protests against his rule. One MP who campaigned for the constitutional amendments, Mohammed Abu Hamed, told AFP news agency that Mr Sisi was a president who "took important political, economic and security measures" and who had to be allowed to "continue with his reforms" in the wake of the unrest in neighbouring Libya and Sudan. But Khaled Dawoud, of the liberal al-Dustour party, dismissed the argument as "absurd" and told the BBC that the changes represented a "power-grab" by Mr Sisi. Article 140 of Egypt's current constitution, which was approved in a referendum in 2014, currently says that the president serves four-year terms and may only be re-elected once. A transitional arrangement outlined in article 241 would extend Mr Sisi's current term by two years and allow him to stand for one additional six-year term in 2024. The military's economic and civilian activities have already expanded since Mr Sisi became president. It is in charge of major infrastructure projects, and generals occupy key positions throughout the government. Article 200 would be changed to say that, as well as protecting the country and preserving its security, the duty of the military is to "preserve the constitution and democracy, maintain the basic pillars of the state and its civilian nature, and uphold the gains of the people, and the rights and freedoms of individuals". The amendment to article 234 would meanwhile enshrine the role of the Supreme Council of the Armed Forces in approving the minister of defence's appointment. The article had been set to expire at the end of Mr Sisi's second term. The amendments to articles 185, 189 and 193 would enshrine an executive body headed by Egypt's president to oversee the judiciary and allow the president to appoint the heads of key courts, including the Court of Cassation and the Supreme Constitutional Court, as well as the public prosecutor.